Advisors who set aside just a small amount of time can maintain their social media presence and reap the rewards of new clients. At a family reunion last year, I caught up with my cousin who has been a financial advisor for the past 15 years. The topic of social business came up, given his work and mine as a manager of customer success at Hearsay Social. An avid proponent of social media for business, he was excited to share some of his recent success stories with me. First, he said that his favorite thing about social business is the fact that “it works while he sleeps.” In fact, his two single largest accounts originated simply because he managed an up-to-date and compelling social presence. After finding him through an advisor-search tool on his company’s website, these clients researched him on social media before proactively contacting him. Second, my cousin explained that he actually spends very little time on social media. Like most other successful financial advisors, he aims to spend most of his time with clients. But he does set aside a small amount of time to keep his profile up to date, grow his network, listen for key buying signals from his prospects and clients, and share relevant content. When it comes to your social presence, you may already have multiple accounts, handles, profiles, etc. That’s why one of the best things you can do is take a step back and look at your social footprint as a whole. Think about what your clients and prospects will find when they search for you. 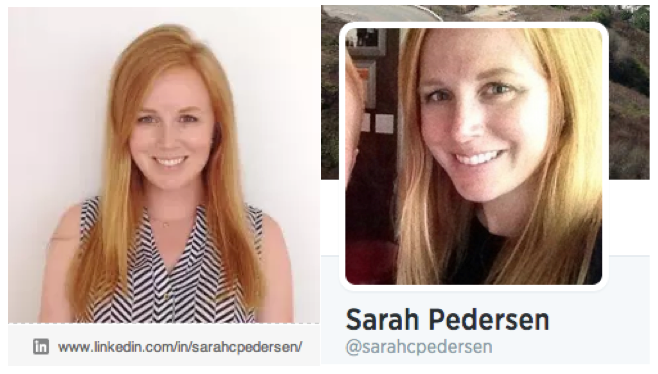 If someone searches for me, for example, they will find me consistently listed as “Sarah Pedersen” across LinkedIn, Twitter and Facebook, and they will also see that my custom URL ends in “/sarahcpedersen” to make it easy for folks to find me in multiple online locations. Additionally, while I do use different photos of myself on different sites, they are all up-to-date and professional (see below). These days, prospects are not just looking for your advisor page (if you have one). They are also looking you up on LinkedIn, Twitter, and Facebook to learn even more about you. Did you know 97% of customers search for local businesses online and 92% of consumers trust ‘word of mouth’ (social media) above all other advertising? Consumers trust not only what other consumers say but also how you present yourself online. If your name is Robert, for example, make sure that you are “Robert” on all of your findable social media accounts. If you go by Bobby on Twitter, Rob on Facebook, and Robert on LinkedIn, you are missing out on key opportunities to attract new prospects. What to do? Spend 5 minutes each week making sure your profiles are up-to-date, consistent and compliant with your company/brand standards. Years ago, when brands were just starting to dabble in social media, many were concerned about negative feedback. The fact is that whether you have a profile or not, consumers are probably already talking about you online. So why miss out on a chance to be a part of this conversation? If people are saying something negative, use it as an opportunity to show your dedication, transparency, and commitment to do right by the customer. Did you know that 83% of people who complained on Twitter loved the response from those companies that did make an effort to respond? It’s up to you to turn a negative situation into a positive one. One trait that we see in some of our most successful advisors using Hearsay Social is that they have a sincere interest in learning more about their audience. These advisors actively and regularly seek feedback from their connections to determine what motivates them, what interests them and how to best serve them. By asking relevant questions on social media, you will not only show a true commitment to your clients and prospects, but you may even uncover a niche area of expertise that can allow you to find more leads. 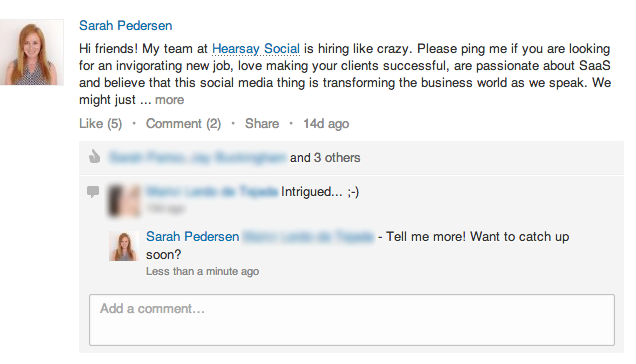 All too often, I witness what I consider to be one the biggest faux pas in social business: the dangling conversation. An advisor posts a great article with some relevant insights for his connections, a prospect comments asking for more information, and then…no response from the advisor. While posting content on social media is critical to social business success, it is also essential to follow up on responses you receive. If a prospect says “Great article!” thank them and ask what part of the article resonated with them in particular. You may even consider asking for a meeting if you find that appropriate. If a client shares your content, consider picking up the phone to offer her more relevant information. Remember: social business does not necessarily transpire 100% on social media, though it’s often initiated on social media. Also, remember that 91% of online adults use social media regularly and that there are more devices connected to the Internet than there are people on earth (seriously). Your clients and prospects are always connected. So don’t miss out on the opportunity to continue a dialogue and build a relationship. Pick up the phone, send an email or even comment back in-line to bring those conversations back to life. Make sure you set aside 5-10 minutes a week to check in on your posts moving forward.